Back to vinyl, back to records. This post is a nod to Dave Brubeck. Specifically, it’s a post in honor of Dave Brubeck, who passed away five years ago on December 5th, 2012. He was 91, a day shy of his 92nd birthday. To celebrate (and reflect), I wanted to profile an Brubeck album of mine, but one that wasn’t ‘Time Out’. Not that that isn’t a good album. Everybody knows about that one, from the kool kid hipster to the good folks at NPR, and I’m sure representatives from both demographics will be talking about it today. No, I wanted to profile an unconventional album that still manages to display Brubeck’s talents. With that in mind, I chose the album that was Paul Desmond’s personal favorite, ‘Jazz At Storyville’. Recorded early in the afternoon one fall Sunday, this tape finds the Brubeck Quartet at George Wein’s jazz club Storyville. Well, it’s not really a quartet. The bassist Wyatt Ruther, wasn’t there. According to Nat Hentoff, he was unable to make it. According to Brubeck, he was sick. According to Desmond, he was asleep in the bathtub. Perhaps it was all three. Drummer Lloyd Davis was able to make it despite being sick himself, so he sticks to brushes (that was fun to write) and softly knits away on the drums and is almost inaudible. That leaves Desmond and Brubeck free to play as if it was just them, a duet. There was barely anybody at the club at the time, so they were mostly playing for themselves, and the sparks were flying. Luckily, it was recorded. I read somewhere that Brubeck said that the phrase he played at the beginning of his solo was in response to something Desmond had just played as he ended his own solo. Desmond’s solo, indeed the first half of the song, was lost due to bad tape (again, according to that same something I read), which is a shame. It would be interesting to hear Desmond solo over the unique chord progression they used that transformed what is usually a somewhat bright and hopeful song into one that isn’t so positive in outlook. Well, the outro wasn’t, anyhow. Brubeck’s solo stayed in the major key, exploring the tune’s nooks and crannies as Mr. Harold Arlen wrote them. This is a quieter, more reflective side of Brubeck than the Brubeck critics loved to hate. I read somewhere else (I do a lot of reading) that this group had a high “yeah” quotient, describing how many times the bandmates would be so knocked out by what the others were doing that they would audibly affirm them. It’s a high honor for musicians to compliment one another in this manner, and Brubeck’s group did this frequently, including in the presence of microphones. On this track alone, Desmond says “yeah” like three times, finally becoming so knocked out that he decides to close the tune out after a particularly intriguing passage by Brubeck. Desmond’s voice can be heard telling Brubeck “eight out, remember the changes” just before his alto sax states the melody in the new ‘changes’. It’s a haunting modulation and arrangement, and I assume Desmond came up with it since he told Brubeck to remember them. Wonderful and memorable music. Of course, it wouldn’t be a Brubeck album if there wasn’t a backstory. If you couldn’t tell from listening to the track above, the music wasn’t professionally recorded. A friend, Boston University student, and fellow pianist named Fred Taylor wanted to bring his reel-to-reel tape recorder into the club to record them. Brubeck agreed, and so Taylor taped their Sunday afternoon appearance, while there was barely anybody in the club. 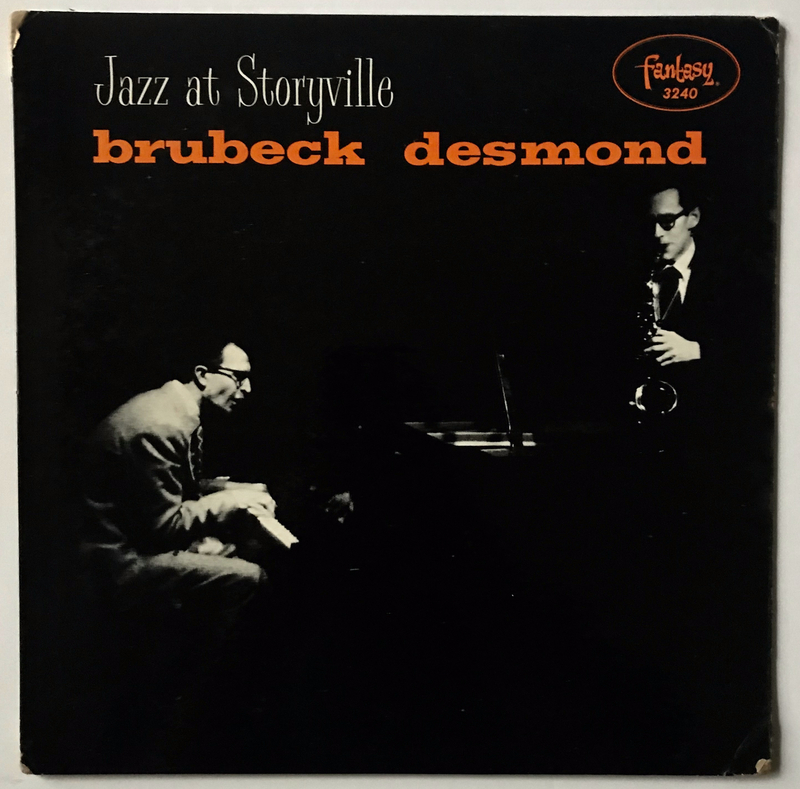 Brubeck and Desmond liked it and they took the tape to Fantasy Records, who released three tracks from their October appearance as well as a track from their 1953 appearance. For Fred Taylor’s enterprising efforts, Fantasy gave him a credit on the album. I’d love to hear the entire tape from those sessions, but the chances of that tape even existing is slim. The rest of the music on the album is in the same vein, all live recordings. The sources, however, are not the same at all. Of course, this being a Fantasy album, you wouldn’t know it, since there’s no mention of it on the album. This album is an amalgamation of sorts, with random tracks from random tapes being thrown together. 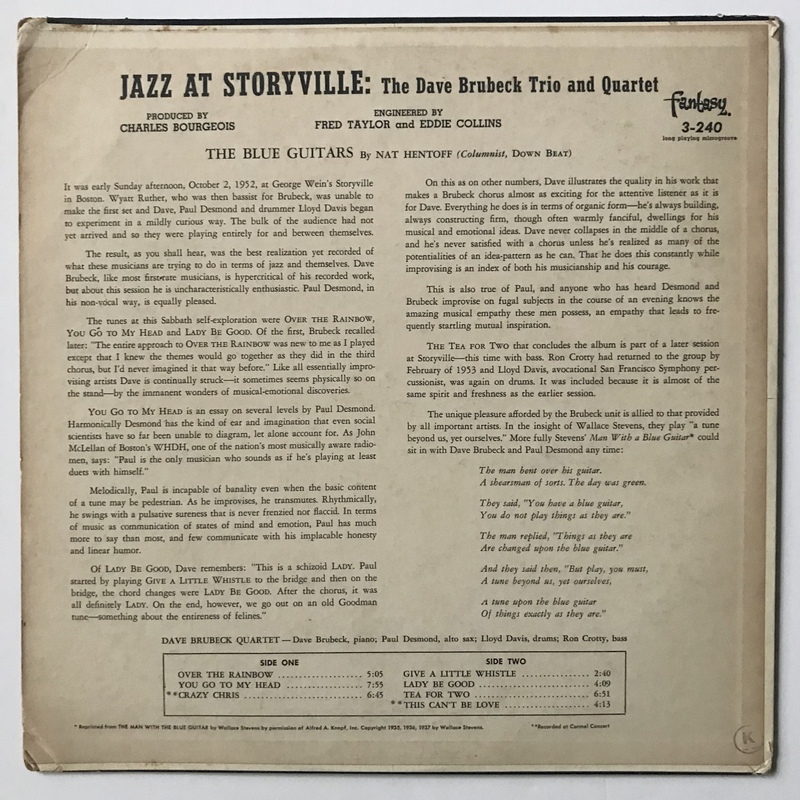 ‘Jazz At Storyville’ was originally released as a 10-inch record in 1953, and it only had performances recorded at the actual club of Storyville, which were “Over The Rainbow”, “You Go To My Head”, “Give A Little Whistle/ Oh Lady Be Good”, and “Tea For Two”. 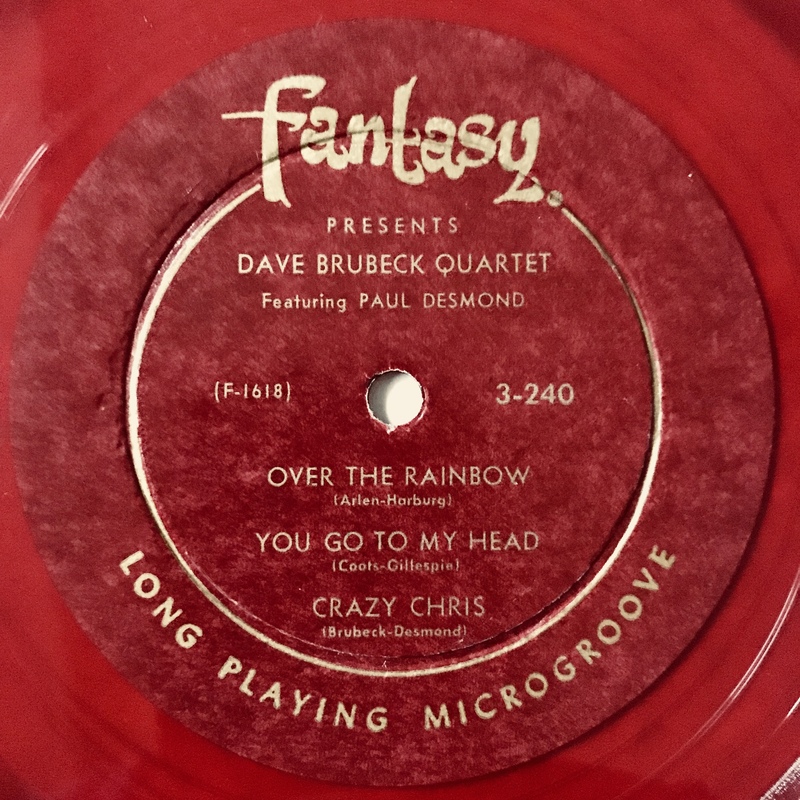 In the mid-1950’s, Fantasy released the music again as a 12-inch record, but instead of using more music from the same tapes or even the same club, they tacked on two previously-released tracks from two separate albums of two different recording dates with different personnel on each track. The logic defies comprehension. The only hint of something fishy is the asterisk that says that some of the music was made at a generic ‘Carmel Concert’. The issue with that is, only one of the tracks was from this Carmel concert, and that’s the “Crazy Chris” on the first side, with Bob Bates and Joe Dodge on bass and drums. That was recorded on 26 June, 1955. The other track, “This Can’t Be Love”, was recorded at a California jazz club in 1952, and features Wyatt Ruther and Herb Barman on bass and drums. Crazy Fantasy people. Fun fact: That phrase that Brubeck said he played as a response to Desmond? He was so taken with it that he ended up taking it and developing it into a composition that became “Summer Song”. 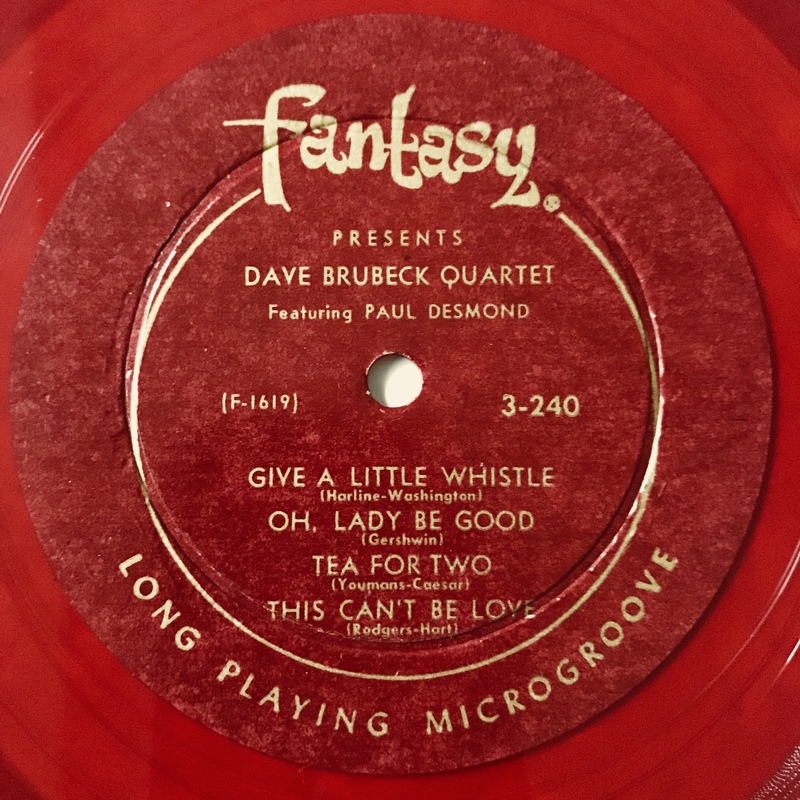 Brubeck recorded this tune in the studio four times in a variety of settings, ranging from his own quartet to a moving version with Louis Armstrong. Here’s the first version he did with his quartet in 1956. This is some cool artwork. When one thinks of a jazz club, this is the type of scene that often comes to mind- dark, mysterious, with the musicians busy at work. The cover art here accurately depicts that. Brubeck is hunched over the piano, caught in the middle of supporting his musical accomplice, who is situated in the curve of the barely visible piano and blowing some music of his own. The black and white photography combined with the overwhelming darkness makes for an oddly inviting cover. It almost beckons the record buyer to investigate the music stored within the cardboard cover. It’s also notable that their last names are placed above their pictures. Apparently in the early 1950’s they were already popular enough to be recognized by their last names. The liners are actually rather interesting and informative, if not brief, written by the inimitable Nat Hentoff. Fantasy opted to simply reprint the original liners from the 1953 album instead of making new ones for the re-release. As a result, there’s no mention of the other two tracks other than in the little box. The liners are filled with interesting reflections on the tracks by Brubeck himself. Again, they’re pretty brief. Fantasy didn’t laminate their covers during the early 50’s, so the paper on the back has begun to darken with age. As was typical fashion for Fantasy Records, this album was pressed on translucent red vinyl with matching labels and severe deep-groove. For all of Fantasy’s hokey ways, these multi-colored clear records are pretty neat. The fidelity on most of Fantasy’s albums are surprisingly good, although this album’s music isn’t hi-fi at all, having been recorded on a portable reel-to-reel. The album also seems to have been a favorite of the previous owner, as there are audible signs of repeat-playing. That’s the price we pay for used vinyl! Like most of experiences here, I was minding my own business, perusing the new arrivals in the jazz section when this album showed up behind a Count Basie album. After I embarrassed myself by yelling out loud, I quickly nabbed it. It was a bit pricey at $20 (the store owner charged me more because I was- I mean the record- was colored), but it was a Brubeck, and a great Brubeck at that. I say this every time, but it’s the truth. I could do a commercial for my local record store. The amount of jazz vinyl that this independent record store manages to get is mind-blowing. And in north Alabama?! Come on. Who would’ve thought?